I still don’t know how something I scribbled in a hurry at 3am got so many notes in the space of a day? Shakespeare is clearly too awesome. I spelt “bated” wrong, awk :) Someone said this looks like a serial killer’s notebook, which made me laugh a lot. They’re not wrong, I’ve been a sleep deprived zombie lately. Maybe this will nudge me out of my sloth and back into active Tumbling. 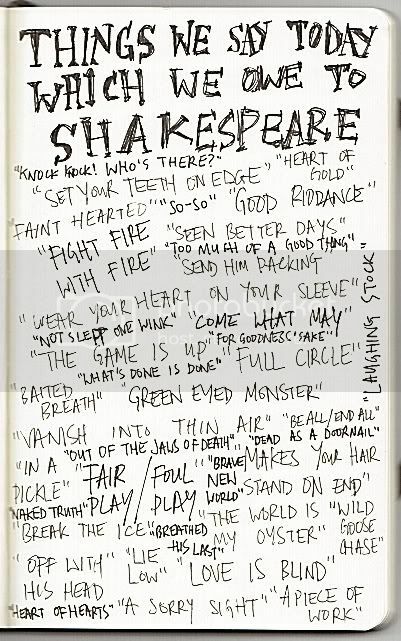 I don't see eyeball on there, but that's something else Shakespeare coined. Eyeball. It's just magnificent. We take a lot of words and phrases for granted, you know that?